In my last post on Facebook, I provided my estimate of value (about $ 70 billion) and concluded that I would not be a buyer of Facebook shares even if the company was valued at close to $ 70 billion. A few of you have taken me to task for leaving what you see as easy profits on the table, noting that if I were able to get Facebook shares at the offering price, that I would be guaranteed (or close to guaranteed) a substantial profit. More generally, there is the perception that investing in IPOs at the offering price (and making money on the offering day pop) is a low-risk, high return strategy that can be used to augment your portfolio returns. Like most "sure" things in investing, this one comes with implicit assumptions and costs and is definitely not "sure". Here is my list of caveats for those considering the "Facebook IPO Pop" strategy. Let's say that when the Facebook IPO does get "priced", you bid to buy shares at the offering price. One of two things will happen: you will either get your requested number of shares or you will not, and ironically, it is the former that should worry you. If you are right in your basic hypothesis, i.e., that IPOs are under priced, the demand for the shares at the offering price will exceed the supply and the investment bankers managing the IPO will have to ration the shares. If the process is fair, you should get only a proportion of the shares you asked for, with the proportion getting smaller as the shares get more under priced. If the process is fixed and the investment banks give first dibs to their preferred customers, the proportion you get, if you are not one of the preferred customers, will be even lower. Thus, the only scenario you should dread if you are not a preferred customer is one where you get your entire allotment filled, because that is an indication that the shares are over priced. This allotment process has always been the achilles heel of strategies that try to invest across all IPO offerings. 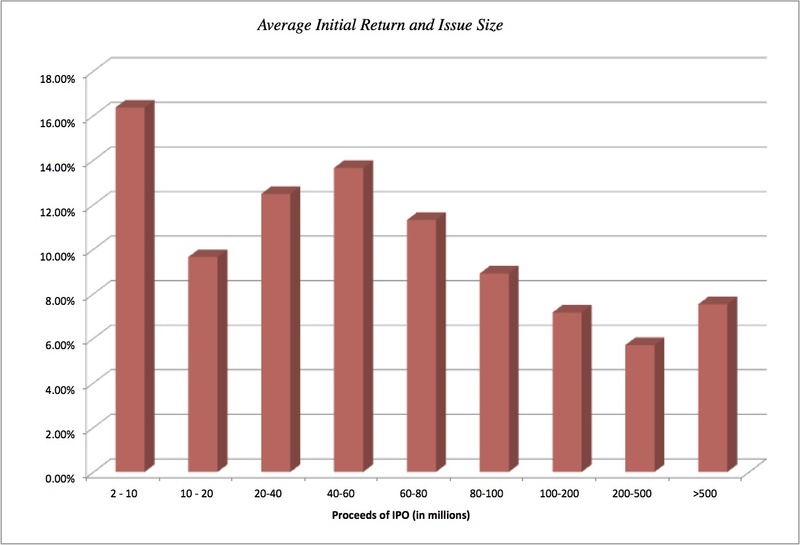 You may bid for $100,000 worth of shares of every IPO for the next year, but you will end up with a portfolio that has too little invested in the most under priced IPOs (since you will get far fewer shares than you requested in these) and too much in the most over priced IPOs (since you will get all of the shares you asked for with these). Note, though, that this return presupposes that you can invest an equal amount in each IPO, under priced or not, but it is still impressive. 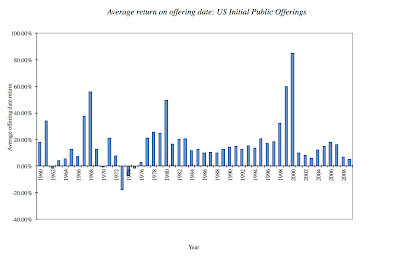 Over the entire 50 year time period, there have been only four years (1962, 1973-1975) where the average returns were negative, and there are periods, such as the late 1990s, where the average return is close to 100% (doubling of price on the offering date). That is good news for the "Facebook IPO Pop" strategy. Given the size of the Facebook offering (even 5% of $100 billion makes this a big offering), this graph should lead you to lower your expectations of the price pop on the offering date. There is also evidence that this under pricing is by design. The IPO pricing cookbook at most investment banks includes a "take 15% off the value" ingredient in every pricing recipe, since the positive news stories that accompany the pop are viewed as a sales pitch for future stock issues. The under pricing also is consistent with the incentives for investment banks, who generally guarantee the offering price to the issuers, and thus have fare more to lose by over pricing than from under pricing. This IPO under pricing has been the source of angst for some, who feel that the under pricing is unfair to the founders/owners of the company going public, since they are leaving money on the table, by offering their shares at a discounted price. That argument, though, becomes less persuasive, when you recognize that only a small portion of the outstanding shares is generally offered on the offering date. The discounted price on these shares operates the same way a loss leader operates in a retail store: it is designed to whet your appetite and get you to buy more. You hope that those who buy these shares (and feel good about the profits they make) will be back in six months or a year to buy more shares in the company. So, if you are feeling sorry for poor Mark Zuckerberg on the offering date, don't worry! There are plenty more shares in Facebook that will be hitting the market in future years. From an investor's perspective, what can go wrong? 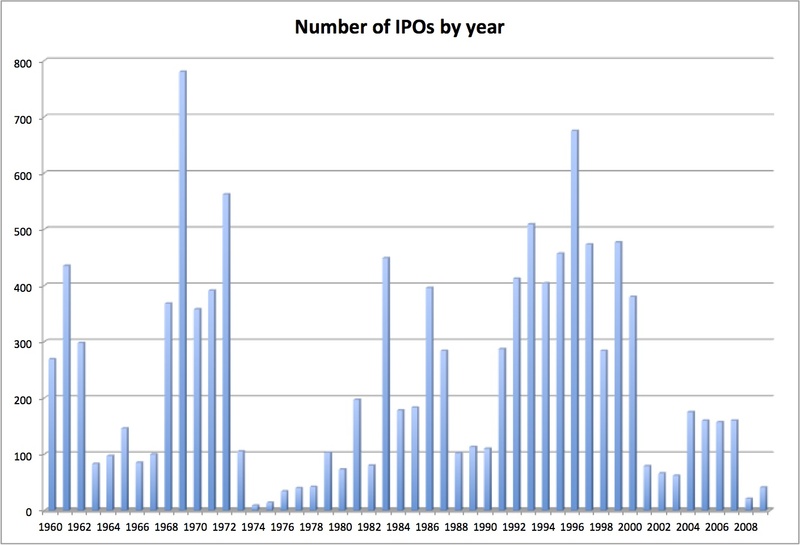 Note that the average is across all IPOs (and is skewed by the smallest IPOs) and that a subset of IPOs see a drop in price on the offering date. These are of course the IPOs where you got all of the shares you asked for. 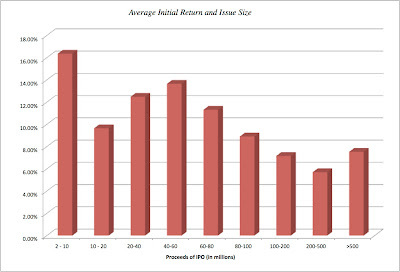 If you are not a preferred customer, your odds of making money on IPOs decrease. Even the preferred customers are offered a mixed bag. Not only does their preference stem from the large amounts that they pay the investment banks for other services rendered, but they are expected to be "good" investors. In other words, if they flip the stock soon after the offering, it may endanger their preferred status on future IPOs. More on that in the next section! Assume now that the first two pieces of the puzzle have fallen into place. You have been allotted shares in the Facebook IPO and the stock has popped 15% on the offering date. Should you sell now or should you wait? That eternal question has particular resonance with IPOs, because the gains on the offering date can be fleeting. Remember that Groupon's 20% jump on the offering date is now all gone! 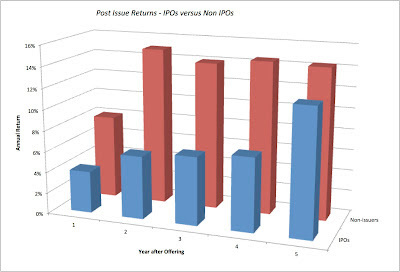 Studies that track the post-offering performance of IPOs suggest that they do are not good investments in the aftermath. In the figure below, we compare the returns in the first five years after an initial public offering, with the returns on non-IPO stocks. 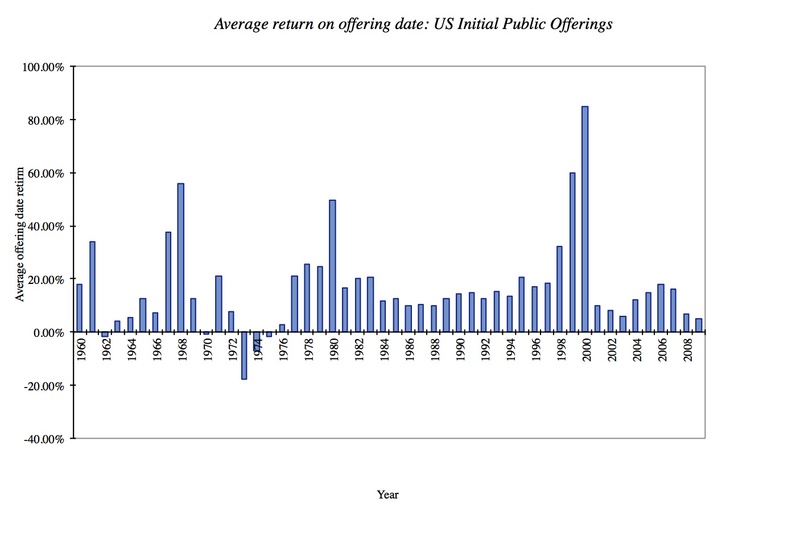 The returns on IPOs lag the returns on other stocks in the market and do so much more in the first few years after the offering. Thus, if buying at the offering price requires you to hold the stock for a year or two (which may be required of you as a preferred customer), you may not be getting a great deal. In fact, my valuation of Facebook is predicated on the assumption that you may want to hold Facebook for more than a day in your portfolio. If you do, once the buzz fades and the IPO paparazzi leave, the company will be judged increasingly by how it performs relative to expectations. If price and value are on a collision course, value always wins out. If you bid for shares in the Facebook IPO offering, I do believe that the odds may be in your favor for winning the game, if you define winning as getting the shares at the offering price and flipping them very quickly after the IPO. Much as I am tempted to join you, I am afraid I will sit out that game and not because of any noble impulses (such as wanting to be a long term investor or not speculating). The IPO game is a subset of the momentum game, on which I have posted before. It is a game that produces big winners but momentum always turns, and when it does, it creates big losers. 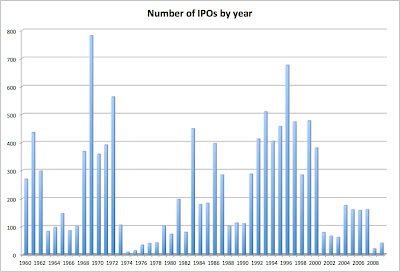 To see the link, note that IPOs go through hot and cold phases, with years in which you have hundreds of IPOs and years in which you have a few dozen. In addition, also note that IPOs in any given year tend to be concentrated in a few sectors and those sectors generally have momentum on their side (dot com stocks in the 1990s, social media companies today). Thus, the success of IPOs in a sector is closely tied to whether the sector maintains it "hot" status. One worrisome aspect of IPOs is that they may operate as canaries in the coal mine in signaling momentum shifts; the loss of enthusiasm for dot com IPOs (and the withdrawals of some) coincided with the epic collapse of the sector that year. The momentum driving social media companies will end one day and it may very well be the day that Facebook goes public. "Unlikely", you say, and I agree, but the tough part of being a lemming is that you never know where the cliff is coming. Of course, you may be able to sense momentum change much better than I, in which case you should be able to play the game successfully. 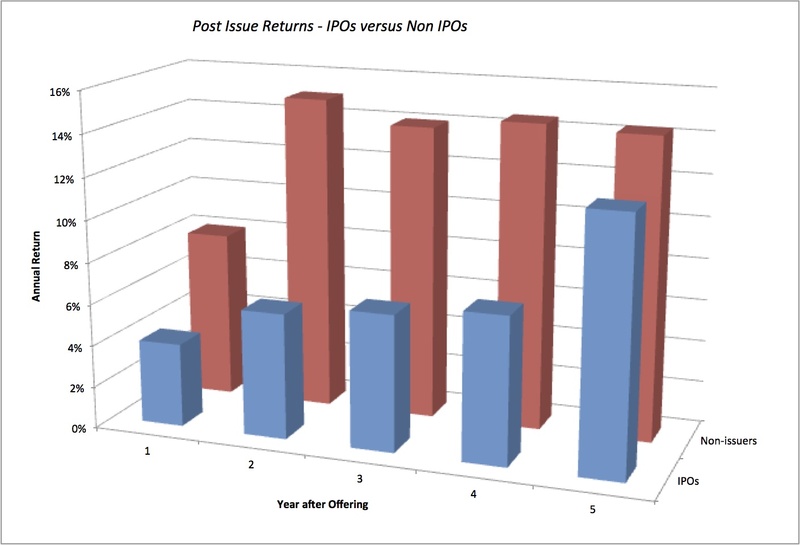 A strategy of investing in IPOs at the offering price looks much better on paper than it works in practice. 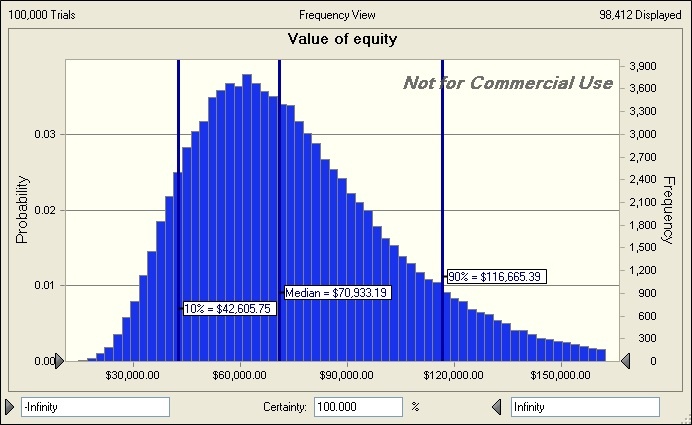 All of the academic studies that show the average underpricing are implicitly based upon the assumption that you can create an equally weighted portfolio of all IPOs, when in fact, a non-discriminating investor will end up will be with too much invested in all of the worst IPOs. The strategy can be made to work by an investor who uses analysis (valuation or information) to invest only in IPOs that are most likely to be under priced and follows through with timely selling to capture profits after the offering. Even for that investor, it is a supplementary strategy since there will extended periods where there are no or very few IPOs in the market. So, if you are bidding for those Facebook shares, good luck. I hope you get only a fraction of the shares you ask for (see part 1 for why), that the stock price pops on the offering date, that you get out before the you-know-what hits the fan. and that you are not the unfortunate soul who helps ring in the end of the social media circus. Facebook is in the news and I will do my usual pre-IPO valuation and posting in a few days on the company but I want to focus in on an interesting story in this morning's New York Times about option exercise and taxation (at both the individual and corporate levels). The story itself focuses on two tax issues. The first is that Mark Zuckerberg is planning to exercise about $ 5 billion of options ahead of the offering, resulting in a tax bill of roughly $ 2 billion for him, about $1.5 billion in federal taxes and $ 500 million in California taxes. The second is that Facebook will be claiming a tax deduction of roughly the same value, which will shelter them from taxes this year and allow them to claim tax refunds of about $ 500 million from prior years. All of this has some in Congress in full "indignation" mode, with Senator Carl Levin saying "“When profitable corporations can use the stock option tax deduction to pay zero corporate income taxes for years on end, average taxpayers are forced to pick up the tax burden,” he said. “It isn’t right, and we can’t afford it.” Before we embark on another tax policy change predicated on a sample of one (Facebook), it is worth examining the broader question of how employee options get taxed, especially at the corporate level. At the moment, if you are a company that grants options to its employees, the accounting laws require you to value those options as options (rather than at exercise value) and expense them when you grant them (though you can amortize these expenses over a period of time). Thus, what you see reported as operating or net income for a company today is after employee options have been expensed. This, of course, is a sharp reversal of accounting policy prior to 2006, when firms had to show only the exercise value of the options at the time of the grant. Since at the time of the grant, employee options were usually at the money (strike price = stock price), this effectively meant that option grants had no effect on earnings when they were granted. However, if and when the options were exercised, companies were required to show the difference between the stock price and the strike price as an expense. To illustrate the difference, assume that you grant 100 million options with a strike price of $10, when the stock price is also $ 10, in 2008. Let's also assume that the options get exercised 2 years later when the stock price is $ 40. With pre-2006 accounting, you would not have shown an option expense in 2008 but you would have shown an expense of $ 3 billion [$40 - $10) (100)] in 2010. In the post-2006 time period, the company would have had to show an option expense in 2008, with the expense computed by valuing the options at the time. (For instance, an at-the-money option with five years to expiration on a stock with a price of $ 10 and a standard deviation of 40% would have a value of $3.36. Carrying this through, the company would have to record an expense of $336 million in 2008 and revisit this expense in subsequent years, as stock prices go up or down. If you want to, you can try your hand at valuing options with the attached spreadsheet). So, what does this have to do with today's story? While the accounting treatment of options changed in 2006, the tax treatment did not. In effect, the tax authorities still use the pre-2006 convention, not allowing companies to expense options when they are granted but only when they are exercised. This creates a disconnect between accounting earnings and tax earnings, which can make valuation more difficult. But is it a loophole? Seems like it, if you only consider Facebook, which will save a billion dollars in taxes because its options will be exercised at a time when its stock price is sky high. But let's add to this sample of one. Take a company like Cisco, which has granted hundreds of millions of options over the last decade. Since the stock has stagnated over the period, many of these options are now under water and will either end up un-exercised or exercised for far less than the value at the time of the grant. If Cisco had been able to deduct these options at the time they were granted (at option value), they would have saved hundreds of millions of dollars, which they may now will lose forever, if these options remain under water. 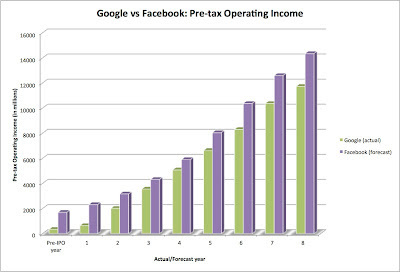 In the aggregate, with the current tax treatment of options, the government collects less in taxes from Facebook and more in taxes from Cisco. Continue with the existing policy of taxing options when they are exercised. The net effect is that the most successful companies (at least in terms of creating market value) will get bigger tax deductions from option expensing than the least successful companies. Change tax law to match accounting law and allow companies to expense options in the year that they grant them. It will smooth out tax collections, level the playing field across companies and create more consistency. But here is the follow up question that gives me a little pause: Should employees who receive the options then have to show them as income in the year that they receive them? If you are being consistent, the answer is yes, but where will they come up with the cash to pay the taxes? After all, employee options are not liquid and the employee while wealthy (in terms of options) may be cash poor. As someone interested in valuation, I have wrestled with options and their effect on value for a while. I think that options are mishandled in many valuations, with flawed arguments (Options are non cash expenses...) and perilous short cuts (treasury stock and fully diluted value approaches) overwhelming common sense. In fact, I wrote a paper on the topic that you can download by clicking here.